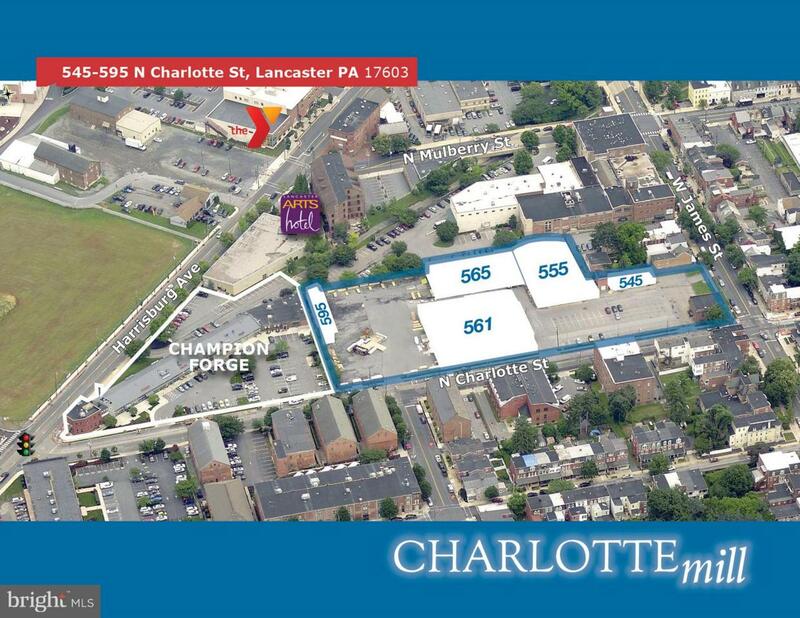 Rare opportunity to participate in Lancaster's next urban renewal, Charlotte Mill is brought to you by the same quality developers as Champion Forge on Harrisburg Ave. Four (4) freestanding buildings totaling 46,437 SF with shared parking on site for 167 vehicles. Exposed brick and huge bowstring trusses in the former showroom are the foundation for what will become the next hottest destination for downtown dwellers and suburbanites alike. Ideal for retail, professional office, hospitality or flex, the 4-building complex is available at a lease rate of $13/SF NNN (estimated CAM $4.50/SF). The buildings are also available individually per address 545 | 555 | 561 | 565| 595 N. Charlotte Street. See floor plans under Documents. Zoning Description Mixed Use: A Variety Of Residential Commercial Cultural Light industrial And Other Miscellaneous Uses Are Permitted. Accessibility Features Other Association YN No Business Type CommercialIndustrial Central Air YN Yes Cross Street W James St Current Use Vacant Electric 200+ Amp Service3 Phases Existing Lease Type Triple Net Heating Fuel Natural Gas Hot Water Electric Incorporated City Name Lancaster City Navigable Water YN N New Construction YN No Number Of Units Total 0 Original MLSNumber 300938399345 Ownership Interest Other Purchase Optional YN No Sewer Public Sewer Vacation Rental YN No Water Source Public Zoning Mu Zoning Description Mixed Use: A Variety Of ResidentialCommercialCulturalLight industrial And Other Miscellaneous Uses Are Permitted.